Wasps and bees are commonly found in structures such as soffit, walls, ceilings, attics, etc. as well as in ground nests. It is critical to identify which type of insect you are dealing with as largely controls how difficult it will be to remove them and affects the price of removal. This Eastern Yellow Jacket can be distinguished from other yellow jackets by the wide arrow shape at the top of its abdomen. Eastern Yellow jackets possess all of the typical yellow jacket physical characteristics, such as a half-inch long stout body, yellow and black coloration, yellow legs and black antennae. Like some Forest Yellow Jackets, the Northeastern Yellow jacket is most easily recognized by the thick black band across the upper portion of its abdomen. However, the Northeastern Yellow jacket will never have the two extra spots through the black band, which are present on many Forest Yellow jackets. This species is often called a ground hornet, most likely due to its larger than average size -- roughly 5/8 inch long. If insects could experience human emotions, they would probably have an identity crisis. This species (sometimes called a hybrid Yellow jacket) is so named because it's thought to be a cross between the Eastern and German Yellow Jacket, and possibly related to the Common and Western Yellow Jacket. Like these other species, Transition Yellow jackets have yellow and black coloration and a stout body, and are roughly 1/2 inch in length. As its name suggests, the Common Yellow jacket possesses all the most common features of yellow jackets: stout body, roughly 1/2 inch in length, yellow and black coloration, yellow legs and black antennae. Aerial Yellow jackets are typically not "picnic pests", but may be attracted to sugary foods such as fruit and soft drinks. They also have been known to follow humans around, though not with the intent to sting. This species will forage for only live prey such as grasshoppers, spittle bug adults, leaf hoppers, tree crickets, flies and spiders. This species is known to have three different marking patterns. Many will resemble the Northeastern Yellow jacket with a solid black band across the upper portion of the abdomen. The majority, however, will have two yellow or brown spots on this black band. Most rarely observed are the specimens without the black band and more yellow coloration on the abdomen. Their stout bodies measure roughly a half-inch in length like most other yellow jacket species. Introduced to the U.S. from Europe, the German Yellow jacket is found primarily in the Northeast. This species is rapidly expanding and now found in limited areas in the Western states of Washington and California. Like most yellow jackets, the German Yellow jacket is roughly a half-inch long with yellow and black coloration. It possesses an arrow shape at the top of the abdomen, much like the Eastern or Transition Yellow Jacket, but this marking on the German Yellow jacket is usually narrower than that of other species. Unique to most species of yellow jackets, Black jackets have a black and white coloration. The queens are often confused with Bald-faced Hornets due to their larger size and similar coloration. The difference is that Black jackets have a white band across the upper abdomen. Workers of this species can also be distinguished from the Bald-faced Hornet by their smaller size. As with most other yellow jacket species, the Black jacket's stout body measures roughly one-half inch in length. Yellow jackets are usually about 1/2 to 3/4 of a inch and have alternating yellow and black markings on their abdomen. These are easily distinguishable from honey bees by the yellow coloration of their legs, as honey bee legs are consistently dark brown to black. In addition, yellow jackets have no hair or "peach fuzz" on their body and they appear glossy when viewed up close. These insects are very aggressive in defending themselves or their nest. Their stinger is not barbed, so they can sting repeatedly. Like honey bees, yellow jackets can be found nesting inside structures such as soffit, walls, ceilings, etc. If not dealt with early on, yellow jackets are perfectly capable of eating through your sheet rock and coming into your home.Yellow jackets are by far, the most common insect we find when called in to do a bee removal. The cost for removing these will be cheaper than honey bees since their nests are smaller but more expensive than bald faced hornets. On a scale of 1-10 of bee removal bad luck...... yellow jackets are a 5. An interesting fact about yellow jackets that many people don't know is that they make no honey. They actually have a hankering for bacon, fish, and hot dogs. They will feed this protein to their larvae which in turn, excrete a sugary solution that the adults will eat. 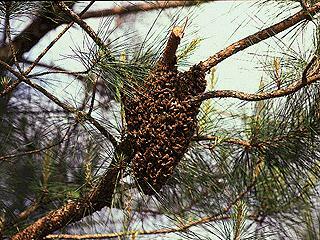 The nest can be quite large for some colonies of Bald faced Hornets. It is made of a papery material and will usually range in size from a softball to a large pillow. Nests can commonly be found hanging from tree branches, bushes, and soffit. These insects are most easily distinguished by there large size, black and white colors and their aggressive nature. Amazingly, Bald Faced Hornets have the ability to spit venom into the eyes of people or predators. I learned this lesson the hard way and you will now see that we wear eye protection on all of our jobs. Bald faced hornets are a best case scenario if you need a bee removal. These infestations are the easiest and least complex to abate so the price to you will be minimal. On the scale of 1-10 of bee removal bad luck...... Bald faced hornets are a 1. European Hornets are easily recognized by their large size and black, yellow and rusty red coloration. About 1 -11/2" long with a plump body shape, the European Hornet can appear rather intimidating. Their heads are yellow and red, and the thorax is black with red markings. The abdomen starts out red and continues with bands of yellow and black. Not common to the northeast, however I have removed them from Watermill Long Island to Greenwich Connecticut. Although typically active during the daytime, European Hornet workers may fly at night in humid, windless conditions and are attracted to external lighting and windowpanes. European Hornets have an exceptionally long seasonal cycle, reproducing from late August through November. Workers prey on a variety of insects -- including grasshoppers and other orthopterans, flies, honeybees and yellow jackets -- to feed their larvae. Honey bees are easily distinguished from yellow jackets by the color of their legs. 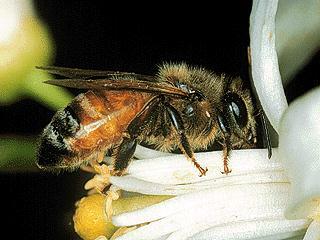 Honey bee legs are uniformly colored as dark brown or black. 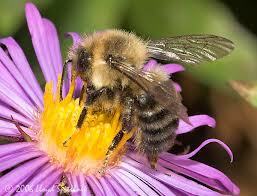 Honey bees also have "peach fuzz" or fine hairs on their thorax, abdomen, and legs. Although they are not as fuzzy or hairy as a bumble bee, they are a stark contrast from yellow jackets which have no hair and appear glossy in color. Another way to determine if you are infested with honey bees or yellow jackets is to observe their entrance. If, during the middle of a warm summer day, you see only a handful of insects around the entrance then it is more than likely a yellow jacket colony. If you look at the entrance and there are 50 or 60 insects at the entrance at any given time, then it is more than likely a honey bee colony as they tend to be much larger than yellow jackets. Honey bees are the insect we see least frequently (to our dismay) and unfortunately for you, this is a worst case scenario infestation due to the large average size of a honey bee colony. This also means that honey bees are the most labor intensive to remove and many pest control agencies won't kill them because they see the importance of this insect to pollinating our crops. We will do a live removal of these bees and relocate them to an organic farm in the Catskills of NY. Honey bees usually nest inside dark voids so if you are seeing an external nest on your property, you aren't looking at honey bees. Honey bees swarm in the late spring and early summer as a means of expanding their species. When a colony of honey bees outgrow their current home, they create a new queen and depart the nest with upwards of 40% of the original colony. These bees will cluster on branches, siding, cars, etc. until a suitable new home can be found. Bees who are swarming are at their most docile state since they have no home to defend. I have a video on this site of a swarm removal that I did bare handed and with no suit or other protective equipment. It nests underground in colonies of several hundred individuals. The nests are usually in abandoned rodent burrows, in mulch, or under logs or debris. The abdomen of the bumble bee is covered with hairs. Bumble bees are much larger than honey bees and look more like flying cotton balls. I have never seen bumble bees nesting inside a structure but have rescued several nests from the ground. Bumble bees are not aggressive and will only sting when provoked. Only the females of the species can sting and the males can be easily distinguished because they are all black. Carpenter bees are traditionally considered solitary bees, though some species have simple social nests in which mothers and daughters may cohabit. However, even solitary species tend to be gregarious, and often several will nest near each other. It has been occasionally reported that when females cohabit, there may be a division of labor between them, where one female may spend most of her time as a guard within the nest, motionless and near the entrance, while another female spends most of her time foraging for provisions. Carpenter bees make nests by tunneling into wood, vibrating their bodies as they rasp their mandibles against the wood, each nest having a single entrance which may have many adjacent tunnels. The entrance is often a perfectly circular hole measuring about 16 millimeters (0.63 in) on the underside of a beam, bench, or tree limb. Carpenter bees do not eat wood. They discard the bits of wood, or re-use particles to build partitions between cells. The tunnel functions as a nursery for brood and storage for the pollen/nectar upon which the brood subsists. It is 2 1/2 to 3 inches long and black with pale-yellow markings on the last three abdominal segments. These wasps are very intimidating to see flying near you but they are one of the least aggressive species. They will only stung if handled roughly and the females of the species are the only ones capable of stinging. Luckily, these scary looking insects also have one of the weakest stings. If you have cicada killers you will see what appear to be small ant mounds dug into any exposed dirt with a hole in the center. These insects burrow underground. It is a black wasp with a long, thin waist, and is not a social wasp. It is not very aggressive and rarely stings people. However, it often builds its mud nests close to human activity. 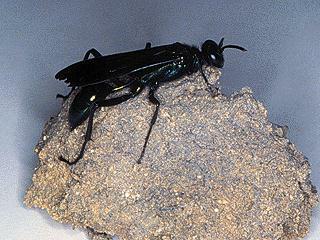 The mud dauber constructs brood chambers from mud on the sides of buildings and under eaves. The wasp stings and paralyzes spiders, lays an egg on them, and seals them inside the chambers. The wasp larva hatches and feeds on the spiders. An emergence hole in the mud means the wasp has emerged from the chamber. This Paper Wasp's coloration is a deep reddish-brown with black lines on the thorax, a darker brownish-black on the abdomen, and golden legs. Females have a reddish-brown face, while males have a golden yellow face. These wasps measure 3/4 inch long. These two species are nearly identical. P. perlpexus tends to have more black markings on its thorax than that of P. carolina. In addition to thorax markings, observation of the nesting habits can be an effective means of distinguishing between the two species. These paper wasps are a dark reddish-brown color, with yellow bands across the body. They are distinguished from yellow jackets not only by their coloration, but also by their pointed heads. Males of this species have curved antennae and more yellow on the front of the head. With their yellow and black markings, European Paper Wasps are frequently mistaken for yellow jackets. As with all paper wasps, their waists are very thin, and their hind legs dangle down when they fly. European Paper Wasps are distinguished by their orange antennae. It is usually yellow with brown markings or black with red or yellow markings. These wasps are aggressive and they readily sting. People are usually stung while trimming shrubbery or cleaning nests from eaves of houses.These wasps also commonly build pancake like nests beneath shutters on your home. Paper wasps have one of the most painful stings of all the insects on this page as i've learned the hard way. 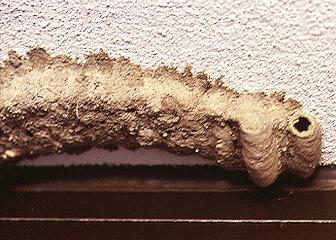 Wasp Nests are built from wood fiber and plant matter that the insects chew and form into a comb of hexagonal cells. Mature nests contain up to 200 cells. The wasps forage during the day and rest at night. Paper wasp nests are made of a papery material that is shaped like an inverted umbrella. It usually has a single comb with up to 250 wasps. Nests are often built under eaves or on branches of shrubs. The eggs are laid in a cell. When the larvae hatch, the wasps feed them. They forage for caterpillars and other small insects to feed the larvae. Additional Note: Our bee removal services are conducted differently than Orkin or Terminex would do. Most pest control agencies or exterminators will use very harsh chemicals that require special licensing to employ. These place your children and your pets at risk. 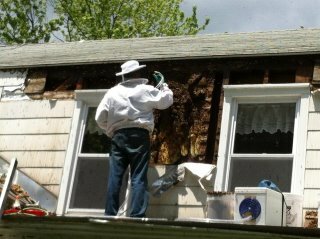 Our bee removal techniques can be done 100% organically without the use of harsh chemicals if you so desire. By removing the entire nest, to include the Queen and all the babies, we minimize for completely negate the need for such chemicals. As bee removal experts we understand the biology of bees enough to disrupt their reproductive cycle and prevent them from returning. A bee removal should NEVER place your family or pets at risk and we will ALWAYS treat your house and property as if it were our own. Please consider The Bee Shepherds for all of your bee removal needs. We can perform any bee removal humanely. We will always perform a live bee removal of honey bees as our mission statement dedicates us to the preservation of honey bees. Upon request, we can also perform live removal of yellow jackets, wasps, and hornets if if violates your religious beliefs to kill them or if it is simply your preference. Content copyright . THEBEESHEPHERDS.COM All rights reserved.